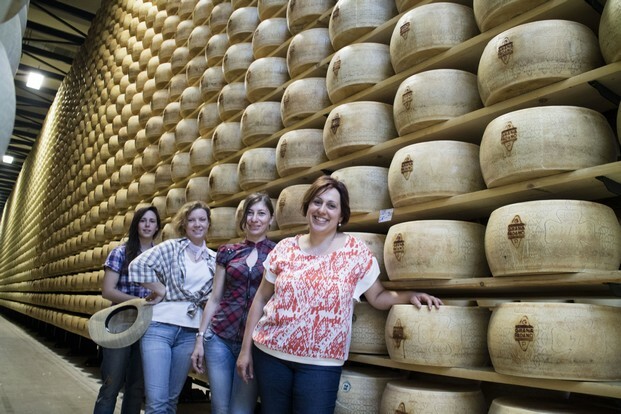 Some people might wonder whether there are any women in the world of Grana Padano. There certainly are! Today, at the Latteria San Pietro dairy, located in Cerlongo, a town in the province of Mantua, we are actually meeting them, the women, who are key in this wonderful establishment. Viviana: she is a pillar of the organization; she is the accounting manager and was working at the dairy in 2003 when, together with the current President Stefano Pezzini, she was trying to turn the dairy around and inject new life into it. With determination and a great deal of responsibility on her shoulders, she managed to make great progress and an excellent job for the dairy, which has expanded and hired more women. 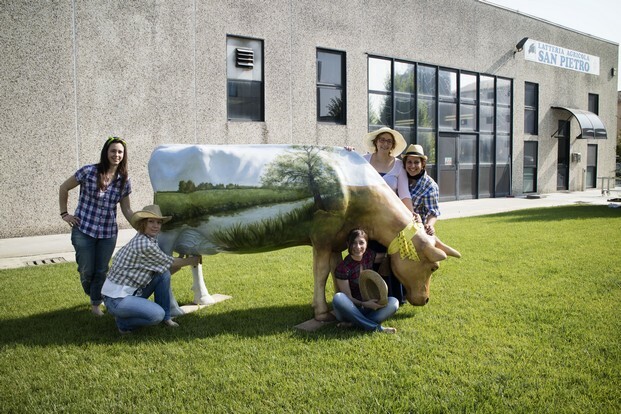 Virna, the Sales Manager, joined the dairy in 2007, Simona, the Quality Manager, joined in 2014, Monia, who works at the reception and helps with administration, joined in 2015, and the last recruit is Laura who is doing a work placement as part of her university course. But at the San Pietro dairy there is no shortage of ideas and spirit of enterprise! 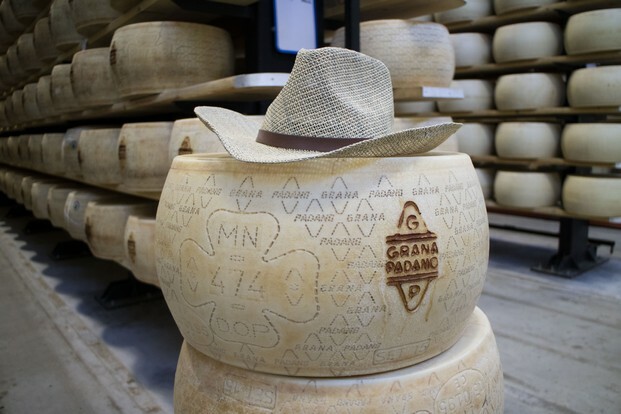 Grana Padano is now also produced - though always in strict compliance with production specification - with the Kosher label, and as from October some wheels will have organic certification. All the Kosher stages of production are overseen by a rabbi: during the milking stage at the dairy farm and at the plant alongside the cheesemaker, the wheels are labelled and given a serial code. Up to the brining stage, they follow a separate route from the rest of the production, the whole plant is “converted” for this cheese. Only during the ageing are the wheels placed in the same storehouse that houses the rest of the production. As to organic cheese, a dairy farm has only recently been set up for this kind of production and they will start with a few wheels and decide how to go on from there. It's all to do with innovation but also promotion. The dairy regularly hosts tourists who come from all over the world, organized through tour operators, to find out how Grana Padano is made. In addition to tourists, there are also school visits, from nursery school upwards, to engage young people in a product that is part of the life and history of the local area, and to teach them how the cheese that they find on their table every day is actually made. But the visits to the dairy are not all. The staff takes part in farmer markets, fairs and, whenever possible, some members of staff go to the town squares with the cauldrons and milk churns to demonstrate how Grana Padano used to be made in the old days. The Latteria San Pietro, along with the other members of the “Permanent Meadows”, promotes the “Grana Padano Fair” which is held every year at the end of October in Goito. All the dairies take part in the event with their own stand in which their cheese can be tasted and bought. 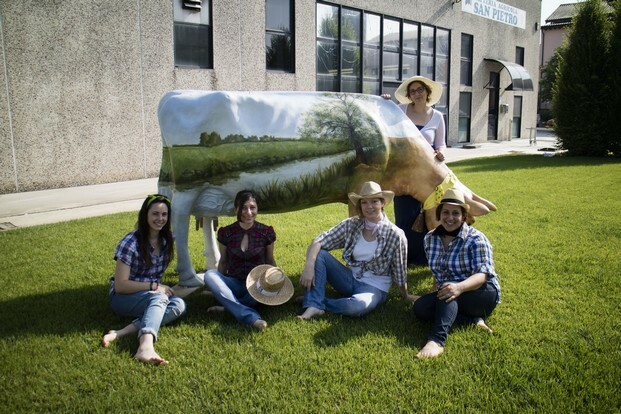 Featuring at last year's fair was the dairy's mascot: Granella the Cow! The name was decided by a public vote from those in attendance. The cow can be milked and it's a wonderful attraction, especially for young children! Thanks to all the staff at Latteria San Pietro for this boost of positive energy and their strong entrepreneurial spirit. Our best wishes for this great milestone, and for a future always at the top!